This morning the sunrise was beautiful. Clouds turned the sky to a brilliant shade of pink and set Longs Peak ablaze with color. Within 10 minutes of sunrise the weather conditions changed rapidly. Rain moved in over the mountains and obscured most of them. 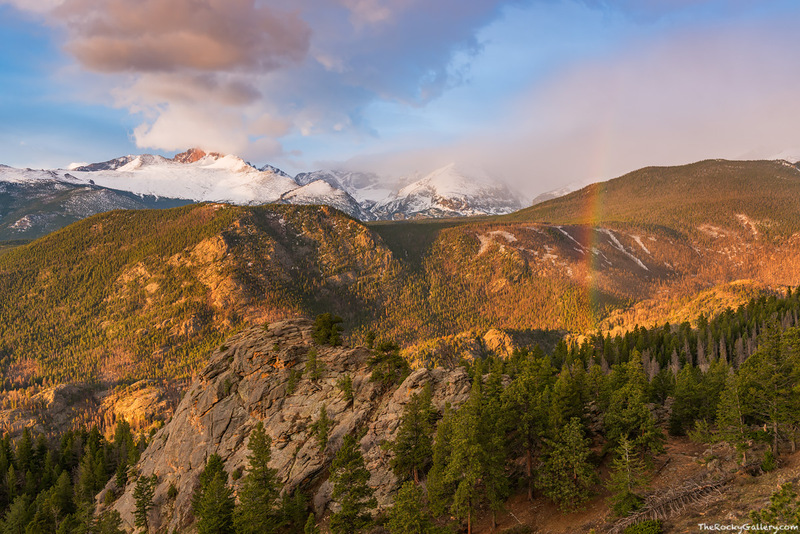 As the rain moved in over Longs Peak and Thatchtop Mountain a beautiful rainbow formed over the Fern Lake burn area. I was lucky enough this morning to be perched on the side of Beaver Mountain in a perfect postion to not only get soaked from the coming rain, but to photograph these beautiful conditions over Rocky Mountain National Park. Photo © copyright by Thomas Mangan.